This year, we planned to feature the "iron men" of each team (yeah, those guys who work out even when they don't have to) in our high school football preview special section. So, I thought it would be cool to do something related to the movie Ironman. I hadn't seen it, so when I finally watched it, I thought it would be easier to go for the look of the first Ironman, the more rustic one that the protagonist builds when he's a prisoner of the Taliban (or whoever they are). Actually, to go for the building process itself. The picture above, which I took for the cover, would have been impossible to make without the help of my friend Ryan Sims and Bill Pettey, the owner of "Pettey Machine Works," the place where the photo shoot took place. Ryan built the "iron" mask just a couple of hours before the shoot and helped me with the lighting greatly. Mr. Petty, besides providing the location and some of the props, fixed the smoke machine (which got busted at the beginning of the shoot) and made sparks on command with his welding equipment. - "Arc reactors" (those lights on the kids' chests): $18.00 (found in the camping dept. at Walmart). - All of the other props: borrowed. - Working with Ryan, Bill and the kids: PRICELESS. 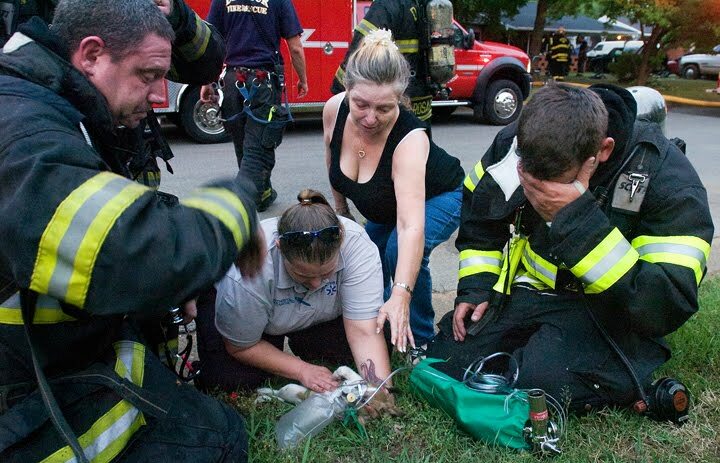 Terrella Joan Otto reaches for her two-month-old puppy, Tookie, as paramedic Cassey Rutherford and Decatur firefighters try to resuscitate the dog, who was in Otto's house when a fire started. Despite the efforts, Tookie didn't make it.